I enjoy every moment spent at this wonderful, warm home of 13. Everyone is inclusive, interesting, kind, and welcoming. Household members share cooking duties, and this night Alice “cleaned the fridge”, finding red quinoa (true? ), lentils, golden and chioggia beets, carrots, cabbage, favas, and potatoes. Let me set the stage. I arrive to find Alice in the kitchen with her “Yodeling Mad: Best of Country Yodel” CD playing, and she greets me with the phrase, “Everything is going in.” Into what, you might ask? Eight shepherd pies! She’s bought yummy vegan crusts, and we step by step assemble her vision into mounds of comfort and belly joy. After topping each pie with a generous helping of mashed potatoes, Alice drizzled them with olive oil, and applied pinches of sea salt and rosemary. I want to eat like this every night. I’m on vacation for a couple weeks, and haven’t really been keeping to my blog routine. ATL, to be specific, and I am cooking in a borrowed kitchen. This is fine with me, as my sister has fun gadgets. 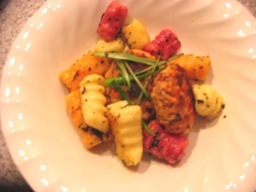 I made a very special batch of gnocchi with salmon croquettes. I was able to borrow a potato ricer and used an informal dough from a previous gnocchi post. These were even better- melty and tender dumplings. (!!) I used two medium yukon gold potatoes, and one medium sweet potato. Here’s where I cheated a bit…I bought canned whole beets. But the beauty of this trick is that I grated a tiny beet for the dough, and used about two tablespoons of beet juice for color. I made one yukon dough, one sweet potato dough, and one mixture of yukon/sweet with a little grated beet and the beet juice. I divided the drained ricotta and the egg yolk into thirds, and roughly divided the flour equally among the batches. I did have to add a little extra flour to the beet dough, but I would do this again without following a recipe too closely because the best tip from the video was that you should feel when the dough is ready. It only took a little mixing, and a willingness to get wrist deep in a bowl of ingredients. Salmon croquettes were common for dinner when I was young. My mom made them like little loafs, and I only liked to eat the crispy exterior, which was a delectable cornmeal crust with just a thin layer of fish. The adult me *loves* salmon! This time the ingredients were bread crumbs (pulverized garlic bagel chips), egg, “spices”, spicy mustard, and salmon that I pre-cooked until almost done. I used two forks to combine, made little patties, and fried in two tablespoons of olive oil. They were so good, and this recipe would be good for any fish or seafood cake. To my favorite sweet potato gnocchi: you are also my favorite yukon gold, and beet gnocchi. Well I finally made the beet ravioli and they were quite yummy! I got organic golden and purple beets from Golden Produce. The beets roasted for an hour, and were so good just as they were. By the way, I think the recipe will make 1500 ravioli, so after about two dozen I was thinking…lasagna. I don’t want these delicious roasted beets to go to waste, and I’m not able to spend the next 6 hrs stuffing ravioli. I’ve got rugelach to make!! For the lasagna I used the cheeses I had in the fridge, the pasta rounds, and a pureed a can of herb tomatoes for the sauce (no pic). Here’s the ravioli recipe. I also made rugelach with apricot preserves, currants, and walnuts. Mmmm! I saw this episode of Barefoot Contessa and really wanted to give the recipe a try. She’s great! So I guess the moral of today’s post is revisiting things you’ve always wanted to do. Enjoy!